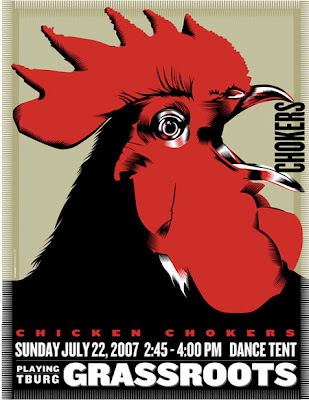 The Chicken Chokers at Grassroots got into the Society of Illustrators (truly, the best of the best when it comes to illustration) show in the advertising section which delights me to no end as it was a job done out of love for local culture, an admiration for the musicians and the tremendous spirit and verve they have and an opportunity, yet again, to do a chicken illustration. Three for three. And it gets into a fairly tough category to boot. Now, let's see who else is in? I heard Scott Bakal got in too! Yeah Scott! The Awards Gala is March 28th, 2008 and exhibition from March 29- April 26. Artwork is to be picked up April 28th -May 30th, 2008.